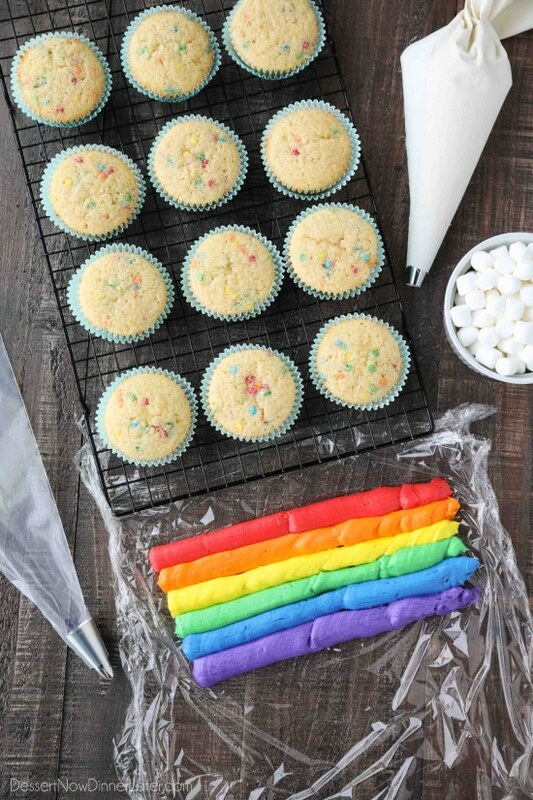 Funfetti Rainbow Cupcakes - Dessert Now, Dinner Later! 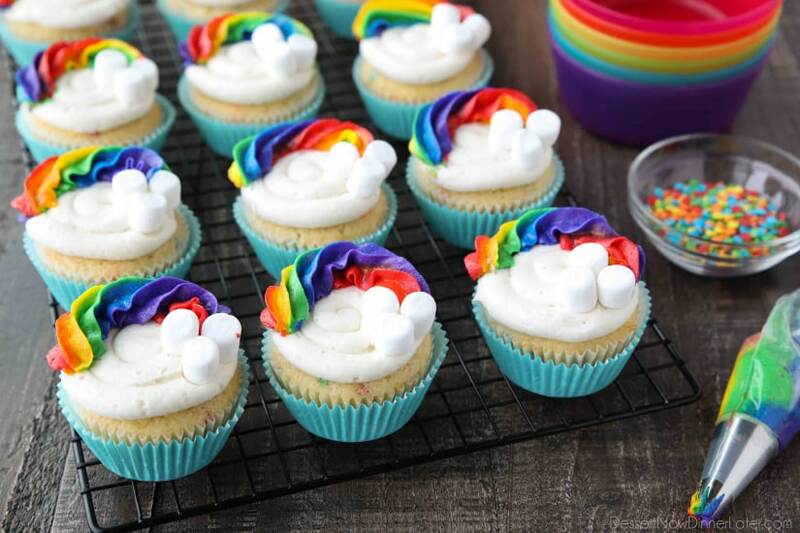 These Funfetti Rainbow Cupcakes are colorful inside and out! Homemade funfetti cupcakes are moist and full of sprinkles. 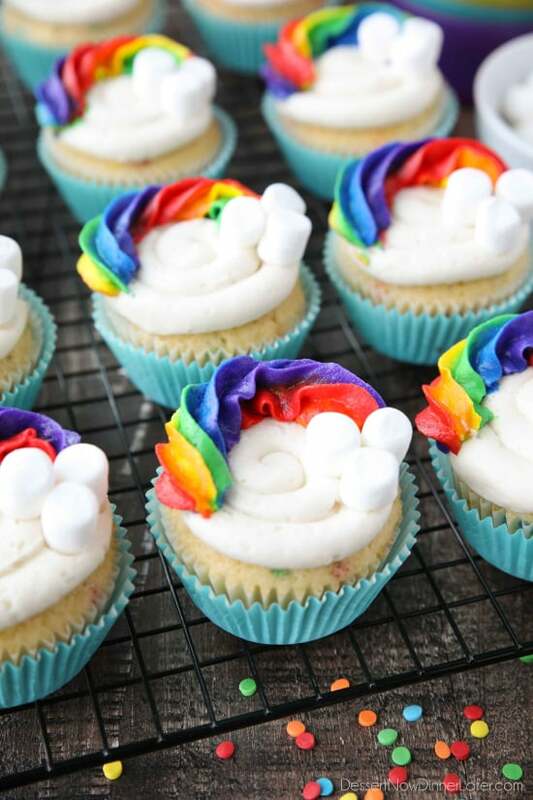 Then topped with a colorful buttercream rainbow and mini marshmallow clouds. 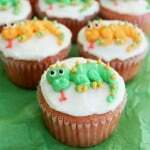 Super fun for birthday cupcakes or perfectly festive for St. Patrick’s Day! 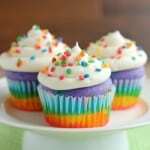 Rainbow Cupcakes are so colorful and happy! They are perfect for spring, summer, or unicorn birthday parties. The festive colors work for boys or girls. Add a pot of gold and they’re perfect for St. Patrick’s Day! 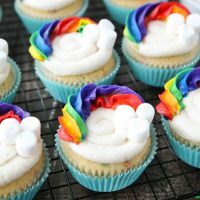 Besides the multi-colored confetti sprinkles in the cake, the rainbow for these cupcakes is in the swirled frosting on top. You could color all of the frosting and pile it on high, but I thought it would be fun to make an arched rainbow with marshmallow clouds. First, I used a Wilton 2A tip to pipe a swirl of plain white frosting onto the cupcake. To make the rainbow icing you will use red, orange, yellow, green, blue, and purple food coloring gel and mix the colors individually. Lift and fold the plastic wrap in half. (The colored icing will stack on top of each other.) Then roll the rainbow icing into a log inside the plastic wrap. Twist the ends. Cut off one end, right next to the frosting, and slide it into a piping bag fitted with either a Wilton 1M or 2D tip. Pipe the rainbow icing into an arch on the top half of the cupcake, TWISTING the bag as you squeeze to show off all the colors. Add a few mini marshmallows at one end of the rainbow for clouds. NOTE: Twisting the bag while squeezing is slightly tricky! Slow and steady works best. I recommend testing the technique on a plate first. 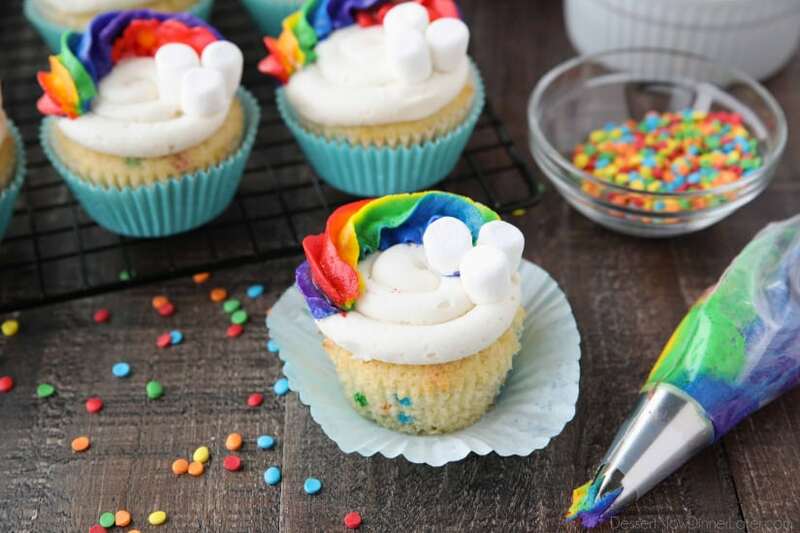 These funfetti rainbow cupcakes are delicious, moist, and full of colorful sprinkles. The rainbow icing on top creates a super fun and whimsical display. Kids and adults alike will want to sink their teeth right in! 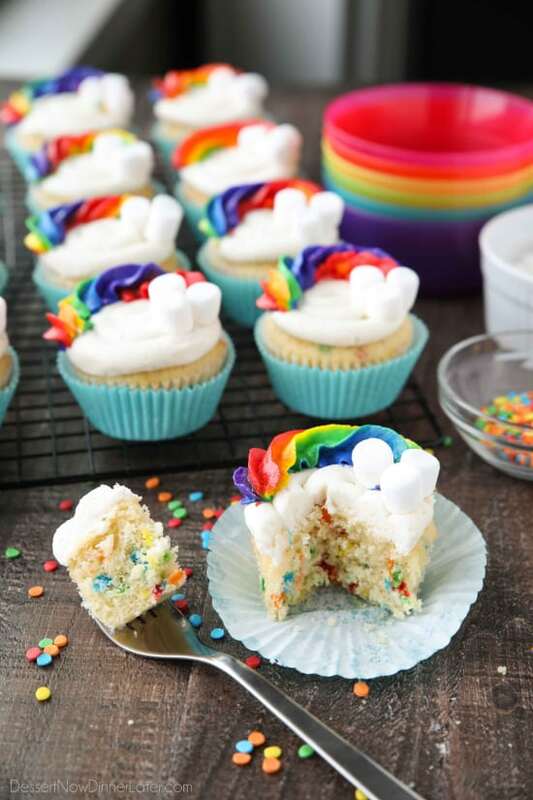 These Funfetti Rainbow Cupcakes are colorful inside and out! Homemade funfetti cupcakes are moist and full of sprinkles. Then topped with a colorful buttercream rainbow and mini marshmallow clouds. CUPCAKES: Preheat oven to 350 degrees Fahrenheit (375˚F if high altitude). Line muffin tin(s) with cupcake liners. In a large bowl, whisk together the oil and sugar. Add the eggs one at a time, whisking well after each one. Add the vanilla and mix together. Add half of the dry ingredients. Mix until just combined. Add all of the buttermilk. Mix until combined. Fold in the remaining dry ingredients and sprinkles until just combined. Do not over mix! Scoop batter 2/3 full into the prepared cupcake pans (about 14 cupcakes). Do not over-fill! Bake for 15 to 20 minutes until a toothpick inserted into the center comes out clean or with a few moist crumbs. Cake will also spring back when touched with finger. 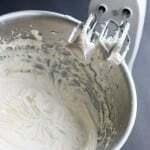 FROSTING: With an electric hand mixer and a large bowl, beat the butter and coconut oil together until smooth. (If coconut oil is very hard, soften [but don’t melt] in the microwave first.) Add the powdered sugar, vanilla, and milk. Mix thoroughly. Add up to ½ Tbsp extra milk for a smoother consistency. Place 1/4 cup of frosting each in six small bowls. Set the remaining white frosting aside. Color each 1/4 cup of frosting separately with red, orange, yellow, green, blue, and purple gel food coloring. Layer the colors in order of a rainbow onto a piece of plastic wrap. (Red, orange, yellow, green, blue, and purple.) 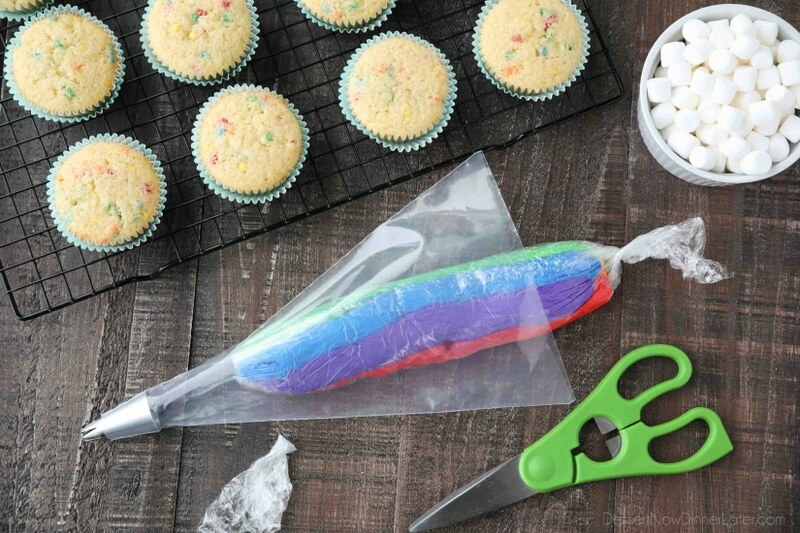 You can spread the colored frosting onto the plastic wrap with a spatula. Or place the colored frosting into separate sandwich-size zip-top plastic bags, cut off the corner, and pipe each one into a straight line onto the plastic wrap. Lift and fold the plastic wrap in half. (The colored icing will stack on top of each other.) 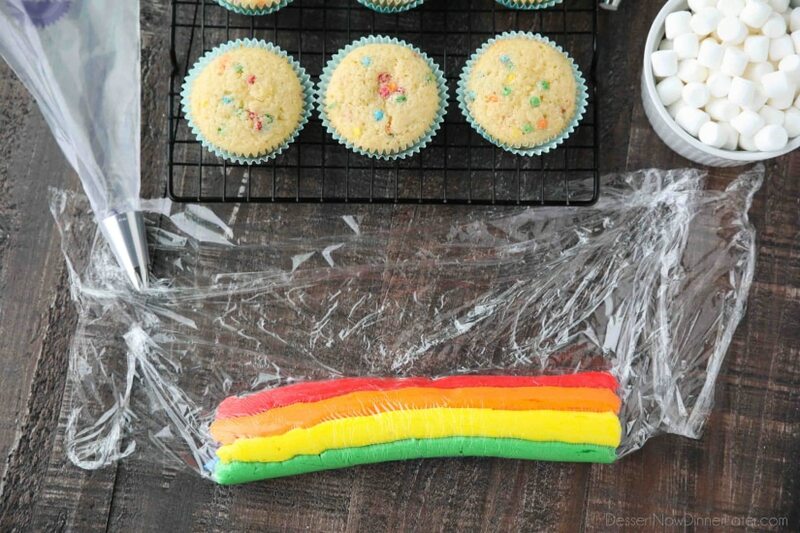 Then roll the rainbow icing into a log inside the plastic wrap. Twist the ends. 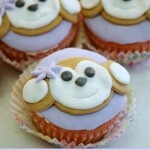 Cut off one end right next to the frosting and slide it into a piping bag fitted with either a Wilton 1M or 2D tip. Fit another piping bag with a Wilton 2A tip. Then add the plain white frosting. Pipe a flat (not stacked) swirl onto the cupcake as the base. Pipe the rainbow icing into an arch on the top half of the cupcake, TWISTING the bag as you squeeze to show off all the colors. (NOTE: Twisting the bag while squeezing is slightly tricky! Slow and steady works best. Test the technique on a plate first.) 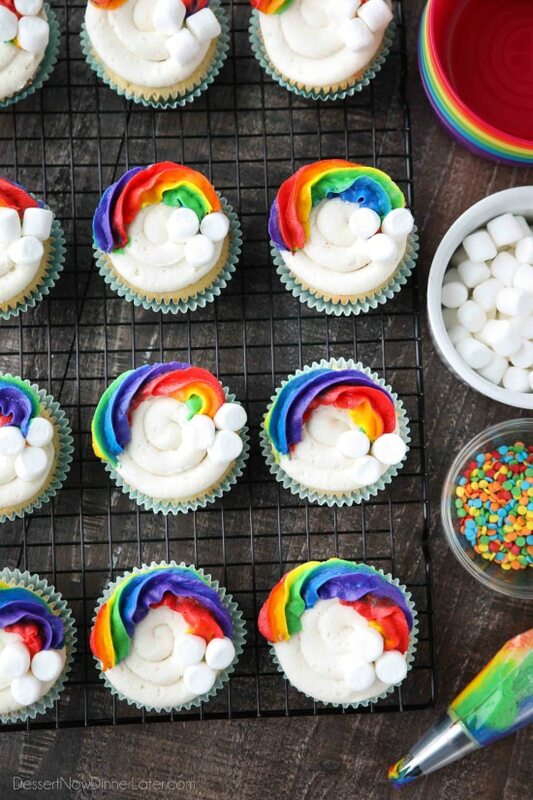 Add a few mini marshmallows at one end of the rainbow for clouds. *Frosting: You can do all butter if you don’t want coconut oil or shortening. A pinch of salt is recommended if you use unsalted butter. Thanks Aimee! They were fun to make!